There is a new role for this long-time housing professional. You may not know her personally, but this long-time player in the housing market knows her way around your home. Not literally perhaps, but in an overall way. After a long career in the central Iowa area, Tawnya Neighbour is branching out. The Ankeny native has become the market representative for Cambria® quartz for Iowa and Nebraska. For more than 15 years, she has held various positions in the home building and design industries, gaining hands on experience with many aspects that have helped evolve her career through the years. Her new position with Cambria began in November. What does the new job involve? 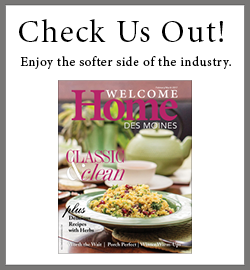 I am working with residential and commercial markets all over the Iowa-Nebraska territory. Quartz has been making huge inroads in residential and commercial use. How does it differ from granite? Cambria is a natural stone surface that is made up of 93 percent natural quartz. The other 7 percent includes resin and pigment. It’s twice as strong as granite, is nonporous and, therefore, doesn’t have to be sealed regularly like granite does. With a nod to the environment, many appreciate that it comes out of the ground in particles rather than large slabs, creating much less waste. But, of course, many people love the beautiful designs that have a similar look and feel of granite, marble, and other quarried stones. What are some of the home design trends taking root today? People are looking for the “wow factor” in homes these days. One thing we are seeing with quartz is the increasing popularity of a waterfall edge design. It calls for vertical application—instead of putting quartz on the top countertop, it might also run down the side of the cabinet. And, for interest, you might even use a contrasting pattern. It creates a huge visual impact on kitchen islands. Is the gray and white trend still so popular in homes? Yes, grays and whites are popular in the kitchen because they help the space look clean and bright. Taupe is also very strong because it’s neutral, but adds a slightly warmer feel. But when you look at all the choices, you can see a wide variety of grays. Some put forth a cool look, and many others have a warmer cast. It’s all a matter of what you like and what looks best in your space. Quality finishes are a big part of the choices we make for homes. That’s for sure. There is much more interest in high-quality finishes. Today’s homeowners crave beautiful spaces that also support everyday use. Cambria provides high-performing durability to ensure stunning surfaces remain that way over the years. It’s completely maintenance free, so homeowners can enjoy their kitchens—cooking and entertaining—without worry or inconvenience. Would you say it’s used more in new construction or remodeling? Quartz is growing in popularity in every category. In our market, it’s used slightly more in remodeling. People are staying in their homes for longer time periods, particularly in the Midwest. Adding quartz countertops is a way to easily upgrade and get a fresh look with a more durable material. Where does quartz fall on price? There are lots of customization options, but Cambria is considered a mid-grade, or middle of the road choice in terms of budget—but the return on your investment is high. Pricing is based off square footage. Are consumers more savvy than they used to be? Consumers are definitely getting savvier. They can do their online research before they ever get to the store. They talk more with friends, they read more, and they watch home shows for all kinds of inspiration. They come in armed with a lot of information. It’s important to remember experts can still help guide and educate on the realities of the home renovation or remodeling process. You say you don’t call yourself an interior designer. No, I don’t have the official credentials for that, but I have learned from hands-on experience over a long period of time. I love to learn about everything in the field. What do you call your own style? I refer to it as transitional, clean lines and appreciation for “less is more.” I like to keep my eyes on new styles, colors, and trends, but I try them out in small doses first to find out if they are a good long-term fit for our home. What have you learned in your own home experience? My husband Jeff and I built a new home three years ago, and it’s our forever home. It has a clean, fresh look with a cream and taupe palette and warmer black accents. What’s funny is that when we built, I knew I wanted Cambria countertops. Knowing the quality of the product is what drew me to want to work for the company. We have three daughters, who are 23, 15, and 13, so it’s still a busy household. We both grew up in Ankeny and plan on being here for many years to come. Both of our families live close by and the community has so much to offer.